This method reduces friction, making the lacing easier to tighten and loosen plus reducing wear and tear. The laces alternate between crossing Over and Under. 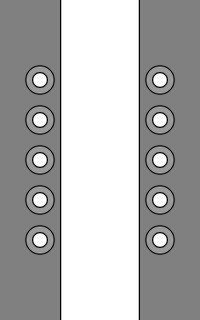 • For even numbers of eyelet pairs, begin straight across on the outside (grey section) and in through the bottom eyelets. 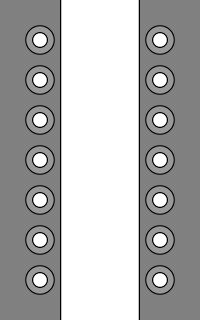 • For odd numbers of eyelet pairs, begin straight across on the inside (grey section) and out through the bottom eyelets. 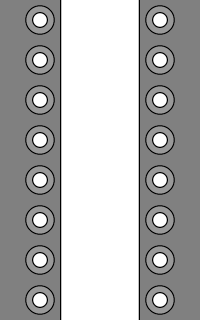 • At each eyelet pair, alternate between crossing over (on the outside) and in through the next higher set of eyelets or crossing under (on the inside) and out through the next higher set of eyelets. Repeat until lacing is completed. • The laces don't rub across the edges of the shoes, which reduces wear and tear on both the shoes and the shoelaces. 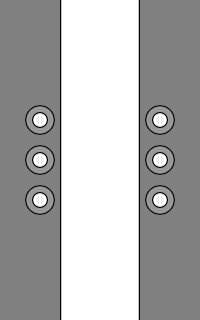 • Because of the reduced friction, you don't really need to pull every single crossover when tightening. Instead, you can pull every second crossover, which is both faster and easier because those that run across on the outside are easier to get your fingers underneath. Colorado Sangers with Over Under Lacing. Lengths available: 27" 36" 36" 40" 45" 45" 54"
Identical length shoelaces to those for basic Criss Cross Lacing. "funnily enough i have also come to the conclusion that the over and under lacing method is best - quickest to tension and loosen, and also provides an even tension accross the shoe, but that is the extent of my pursuit"
"All my life I used the "Shoe Shop Lacing" and always thought that was the only way to lace shoes. I decided to go for the 'Over Under' lacing now and the result is much better. 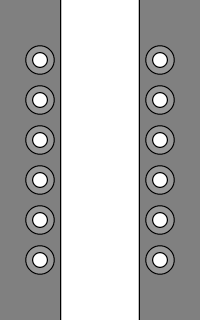 I think this is because of the more symetric way of lacing." "I have been working as a Firefighter/Paramedic for 8 years now, and I have always used tactical boots with zippers on the sides, and never had much issue or need to deviate from standard lacing. I tried a few different methods, which helped some, but still left me tying and untying both the starting knot and the finishing knot (which is no easy feat in a dark room in the middle of the night), and then I found it, the "Ukrainian method" and immediately my problem was solved! With a few modifications, it has become absolutely perfect for my needs (not to mention it looks 1000% better than the ugly zippers). I have the aglet's both tied in separate overhand knots inside the eyelets of the top of the boot. The next loop down I have the Ukrainian captive starting knot (which makes ALL the difference for the rapid donning.) Going downward I have an "Over Under lacing pattern" which aids significantly in the rapid tightening and loosening, (The X marks the spot to pull!). And then if all those aren't amazing enough, then comes the "Ian Knot", which is the cherry on top, the icing on the cake, and the grand finale all rolled into one amazing lightning fast move! Now all my needs (more like strong wants) are met. I no longer worry about the laces coming out of the eyes or dragging on the ground when loose. I no longer worry about quickly tightening. I no longer worry about rapid tying or untying. All of it is solved." If you'd like to send feedback about Over Under Lacing, please Contact Ian. Similar method with each crossover running under the sides then out. 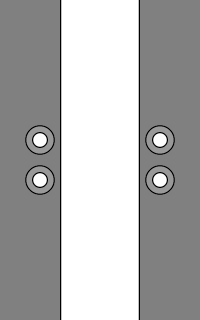 Overs and Unders arranged as a double helix to reduce friction even further. 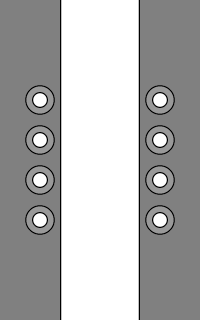 View and customize Over Under Lacing using Create-a-Lace. This page last updated: 09-Feb-2019. Copyright © 2003-2019 by Ian W. Fieggen. All rights reserved.